Tessa Longbons | May 21, 2018. West Virginia’s abortion report for 2015, comprising five pages in the state’s annual vital statistics report, was released online in March 2018. The report is compiled by the state Department of Health and Human Services. 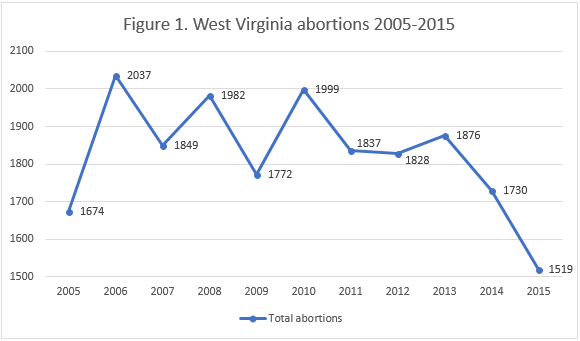 *Information on West Virginia’s chemical abortion totals, state abortion rate, and Planned Parenthood’s market share of state abortions is not provided in the West Virginia abortion report. However, Planned Parenthood’s single center in West Virginia does not perform abortions. Abortions continued to fall in West Virginia in 2015. There were 1,519 abortions performed, a drop of 12 percent from the 1,730 reported in 2014 and a decline of 22 percent from 2004, the first year of data available (Fig. 1). West Virginia’s abortion report does not show many of these abortions were chemically induced. However, a separate, mandatory state report on abortions performed on pain-capable unborn babies, which covers the second half of 2015, reveals that 15 percent of all abortions performed between late May and December were chemical abortions. 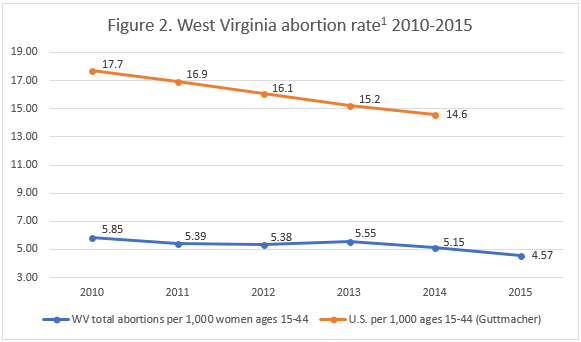 West Virginia does not report the state abortion rate, but CLI estimates that the rate has declined from 5.15 abortions per 1,000 resident women of childbearing age in 2014 to 4.57 in 2015 (Fig. 2). Of the 1,519 abortions that occurred in West Virginia in 2015, eighty-seven percent were performed on state residents. Ten percent of the women were between the ages of 10 and 19, while 58 percent were in their twenties and 30 percent were in their thirties. Just 3 percent of women were age 40 or older. Most women, 82 percent, were unmarried, while 17 percent were married or separated. Age was not reported for four women, and marital status was not reported for 10 women. More than 1,000 women had previously experienced a live birth. Thirty-one percent had one previous live birth, and 40 percent had two more. Over 900 women, 60 percent, had not had a previous abortion. Twenty-eight percent had one previous abortion, while 12 percent had more than one. Twenty-eight women had four or more abortions. West Virginia’s annual abortion report contains information on its informed consent process, as well as limited information on minors who get abortions. In 2015, there were 1,512 women who received the counseling required by the Women’s Right to Know Act before undergoing abortions, while five women did not receive counseling. The abortion report, as well as a separate report on the Act, shows that four women experienced medical emergencies, but the reports do not indicate a reason why the fifth woman was not provided counseling. However, the Women’s Right to Know Report cautioned that 2015 data could change, and the report shows only 1,517 abortions, compared to the 1,519 abortions reported by the vital statistics report. Forty-eight minors obtained abortions in 2015, 47 of whom were unemancipated. However, West Virginia’s report does not state whether these girls’ parents were notified, whether any girls received a waiver to the parental notification requirement from a judge or physician, or whether the requirement was waived because of a medical emergency. In 2017, West Virginia updated its parental notification law to remove the ability of physicians to provide waivers, meaning that from now on such waivers may only be issued by judges. A report submitted by the Bureau for Medical Services to the West Virginia legislature’s Joint Committee on Government and Finance reveals that Medicaid-funded abortions have risen dramatically in the past few years (Fig. 3). In 2009, 677 abortions were covered by state Medicaid funds, representing 38 percent of the total number of abortions performed in West Virginia that year. In 2015, 763 abortions were funded by Medicaid, 50 percent of the state total. As of 2017, that number had doubled to 1,560 Medicaid abortions, although West Virginia has not yet reported the total number of abortions performed in the state in 2017. The state has funded “medically necessary” abortions through Medicaid since required to do so by a court ruling in 1993. West Virginia is unsure of what contributed to the recent increase in Medicaid-funded abortions. However, in 2014, West Virginia expanded Medicaid coverage under the Affordable Care Act. 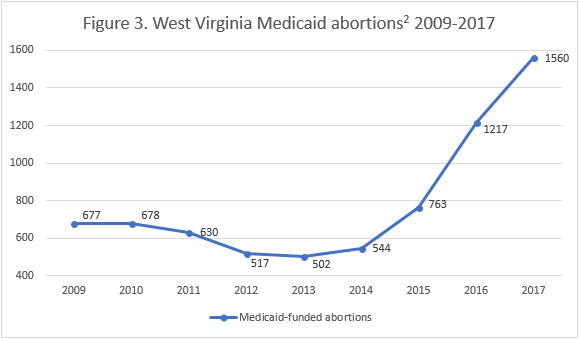 While it is not clear what impact the expansion had on West Virginia’s abortion incidence, Medicaid expansions in other states have increased the number and percentage of abortions paid for with Medicaid. Currently, the West Virginia legislature is considering a bill that would eliminate Medicaid coverage of abortion. The state legislature has also passed a constitutional amendment to clarify that the state Constitution does not establish a right to an abortion or require funding of abortion; the state will hold a referendum on the amendment in November 2018. The amendment would obviate any constitutional impediments to the Medicaid bill. In a 2016 CLI study of state abortion reporting, West Virginia’s reports tied for 21st best. The many recent discussions on laws affecting abortion in West Virginia underscore the need for timely reporting. The sharp increase in Medicaid-funded abortions after 2015 – and the possible decrease if the proposed legislation to end Medicaid funding of abortion goes into effect – are not reflected in West Virginia’s vital statistics report, which lags several years behind. The vital statistics report also does not contain any data regarding the types of abortion procedures, namely how many abortions are chemically induced. West Virginia could also improve its reporting by including more of the information it already collects on the abortion reporting forms submitted by abortion providers, such as the race, level of education, and previous miscarriages of women who get abortions. Additionally, West Virginia could track and report complications or injuries caused by abortion. As the Mountain State takes steps to protect life, improved reports would allow West Virginians and interested researchers to see whether the laws are having an effect. West Virginia does not report the state abortion rate. Rates were calculated by the Charlotte Lozier Institute using population estimates from the United States Census Bureau. The rates were calculated using the following formula: (total number of abortions performed in West Virginia ÷ number of resident women ages 15-44) x 1,000. West Virginia does not report method of payment in its annual abortion report. Medicaid abortion numbers were taken from a report submitted to the West Virginia Legislature’s Joint Committee on Government and Finance by the Bureau of Medical Services.